Scientists on the HiRISE team have discovered what mighe be a once-habitable ancient lake on Mars at Holden crater. 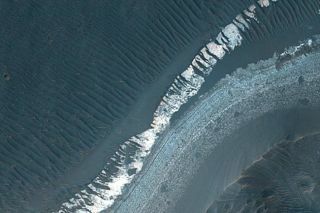 This shows part of the outside rim of Holden crater. Alake that might once have been habitable may have filled a crater for a longtime on early Mars, new spacecraft images reveal. NASA'sMars Reconnaissance Orbiter (MRO) captured the images that suggest thedebris-strewn Holden Crater once held a calm body of water that could haveharbored life. There is so far no convincing evidence life does or ever didexist on Mars, however. Thecrater debris includes a mix of broken boulders and smaller particles calledmegabreccia. "Holdencrater has some of the best-exposed lake deposits and ancient megabreccia knownon Mars," said Alfred McEwen, principal scientist for MRO's HiRISE camera. "Both contain minerals that formed in the presence of water and markpotentially habitable environments. This would be an excellent place to send arover or sample-return mission to make major advances in understanding if Marssupported life." Thatmission could be NASA's Mars Science Laboratory, set for launch next year. The Holden Crater isone of six landing sites under consideration. TheHolden impact crater formed inside a larger impact basin that was crisscrossedby large, natural channels. Blocks as large as 164 feet (50 meters) wereblasted from the basin by the impact, before falling back to the surface toform the megabreccia layer. Waterlater settled a layer of fine-grained sediment on top of the megabreccia,including clay that could preserve any signs of life that might have existed. "Ifwe were looking on Earth for an environment that preserves signatures relatedto habitability, this is one of the kinds of environments we would lookat," said John Grant, Hi-RISE scientist. Thatclay may have remained hidden except for a stroke of luck, when the Holdencrater rim crumbled under the force of nearly 960 cubic miles of water (4,000cubic kilometers) that it was holding back. The resulting flood tore up blocksthe size of football fields and left boulder-filled debris, according to Grant,but also revealed parts of the clay layer. Thefirst long watery period at Holden Crater probably lasted thousands of years,while the second lake that formed after the crater rim was breached may havelasted just hundreds of years, Grant added. Mostevidence for long periods of wet conditions on Mars rests in the planet'searliest history, according to HiRISE scientists. Water may have only flowedlater on during catastrophic events such as impacts on the planet surface.